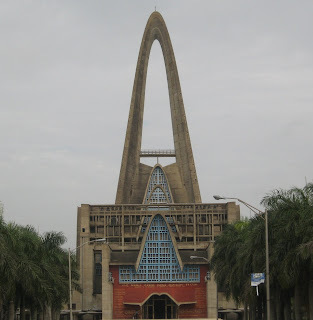 La Basilica in the town of Higuey, Dominican Republic, contains a painting of Jesus’ mother Mary, entitled La Virgen de la Altagracia, patron saint of Republica Dominicana, made by a 15th century Spanish painter. As my wife and I visited while celebrating our anniversary, the tour guide stated many people – including his own mother - pray to this painting, hoping for Mary to make intercession. Thousands visit annually on January 21st to celebrate Our Lady of Altagracia Day, when the beautiful architecture of La Basilica is illuminated after dark. Some of the most spectacular paintings and edifices in the world are religious. Fortunately, it is not necessary to pray to a saint or visit a building to communicate with God. In fact, all believers are saints: “to those who have been sanctified in Christ Jesus, saints by calling, with all who in every place call on the name of our Lord Jesus Christ” (1 Corinthians 1:2). And, we are all priests: “He has made us to be a kingdom, priests to His God and Father” (Revelation 1:6). All believers have one great high priest (Hebrews 8:1) and no need for any other. Each of us has the indescribable privilege of communicating directly with God, as Jesus said, “you will ask in my name, and I do not say to you that I will request of the Father on your behalf; for the Father Himself loves you” (John 16:26-27). James encourages believers to “draw near to God and He will draw near to you” (James 4:8). And, we do not need to visit a building to meet God: “Do you not know that you are a temple of God and that the Spirit of God dwells in you” (1 Corinthians 3:16). and opened up the way for me and you.